Add a stylish touch to your outdoor space with Melrose outdoor 8-piece wicker sectional sofa set by Corvus. Each set includes 3 oversized armless chairs, 2 club chairs, 1 ottoman and 2 side tables, making it perfect for intimate gatherings. The furniture pieces are made from aluminum and resin wicker for sturdiness. With easy-to-clean covers, the beige cushions and five toss pillows offer extra comfort. This set is awesome... cannot compare for the price. It is sturdy, easy to move around and change the layout and is the envy of my neighbors. I am using it around an outdoor fire pit and it is perfect! It arrived just before the snow so I haven't been able to test out the cushions, but they appear comfortable and are well made to withstand wear and weather. It was hard to find covers for the sectional but I ended up going to the cover store and getting their large sectional cover and pushing the pieces together...which works well. This set is well made, beautiful wicker. Colors are perfect, and it came with cute throw pillows. We bought additional inexpensive throw pillows to change up the decor throughout the year. The set came packaged perfectly. Packaged in way that protected the furniture from damage. The chairs are SUPER comfortable and there are so many configurations that can be done with this set. We move the set under cover during bad storms (think hail) but I think they set would hold up well if we accidentally left it outside. We also invested in a good cover. We shopped around and this set was truly a good price for the quality! Highly recommend. I'm extremely happy with this purchase! It looks very nice with the Geo Bongkok area rug. The only thing that could be improved is the softness of the cushions. Measurements panned out well. Hieght and width were all in check. Cushions were decent and all have weathered the elements thus far. I would recommend it to anyone. I personally did not need to assemble any of it. Just removed them and threw the cushions on. I may be bias as it measures well with my patio. We had 1 party on them with 2 to each seat and one on each of the single chairs. No issues. Aluminum is coated and weather resistant. Resin appears solid. I bet it will last awhile. Cant beat aluminum and resin for longevity. Fast shipping. Very high-quality material. The furniture is very comfortable, we highly recommended. I have gotten nothing but compliments on this set, and after its first year it still looks great. If you live in a high-wind area like I do, get a large cover to keep all of the pieces together when not in use. The end tables are very light and prone to blowing over and rolling away in high wind (luckily the resin is strong and doesn't damage easily!). Overall pleased with the set. Needs zip ties to keep the sofa pieces from shifting. Thick visions and comfortable setting. I was very pleased upon receiving this set. The quality is very good. Great looking set and absolute great value! Sturdy construction. Easy assembly. Cushions can slide around but easily rectified with some double sided Velcro patches. Beautiful set. Appears to be well made. Loved the packaging. Very minimal shipping materials with no waste. Nice job Overstock and your supplier. This set looks great and we get lots of compliments on it. Very comfortable and functional too. 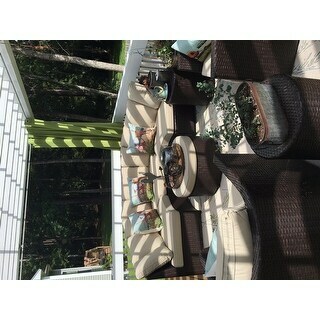 Great patio set for the price! Great quality for the price. 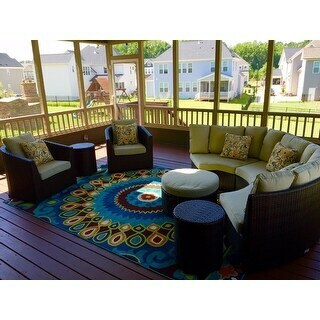 Looks great on my new deck with my curtains from Overstock. Beautiful set for the price. The one big negative is the scratchy, uncomfortable cushions. We will have them recovered at the end of the season which will likely drive the final price up to the next price point ... so in hindsight we would have gone with a more expensive set with Sunbrella or other higher quality fabric. It's a shame because the set is very fashionable and flexible in the ways it can be set up. This is a very nice set; lower priced than I have seen similar sets, but still a bit pricey. This set looks very nice and comfortable. Have gotten many compliments on it. Only negative is that it is very lightweight and moves around easily in heavy winds. The actual frame of the set is great, sturdy, well made and good color. However, the cushions themselves, one tiny bit of moisture and you get damp marks on them. we have them under some trees, so debris and bird droppings land on them. even putting through the wash a couple of times, the cushion covers are irretrievable marked, and don't look very good. I wouldn't buy this, look to something with more mould resistance. This set is amazing! The only downfall is that the cushions mold easy and it is hard to clean even though they can be removed. Buy a cover for it! Perfect fit for our deck. Love this set. Stylish and sturdy. I might would of gone with different cohesion color because it’s hard to keep clean. Beautiful. I hope it lasts in the hot California sun. "I need to replace a cushion that got some weather damage..... Can I order a replacement cushion through overstock?? It's the back pad for one of the oversized armless chairs. Thanks!" "Can you buy pieces separately? We need to replace one chair that was damaged?" Unfortunately we currently do not sell the pieces separately. "Can you tell me if this furniture can stay outside in the winter (Midwest) and are the cushions white or tan ?" The cushions are beige. We recommend you protect the sofa set with a cover or move it indoors so it can always remain clean and new. "Is there a weight restriction. Need an answer as I want to order and can't until I know. " When the seat is less than 48 inches it will hold 300 pounds, when it is less than 72 inches, it will hold 600 pounds and when it is greater than 72 inches it will hold 900 pounds. I don't know, but I have the set seems very sturdy. "do you know where we can get replacement cushions? ours were ruined in a hail storm :("
We recommend you contact our customer service for further information. Thank you. "Can you order a additional armless chair?" Unfortunately, we do not have armless chairs that we sell separately. Sorry we are not selling the armless chair separately. We recommend you contact customer service from Corvus for further information. Thank you. "Are replacement cushions available for this set? After 3 years, they have taken a beating. Need new ones." Unfortunately, replacement cushions are not available. I have somebody locally who does work for me...typically I buy outdoor fabric online and get replacements...hope this helps!